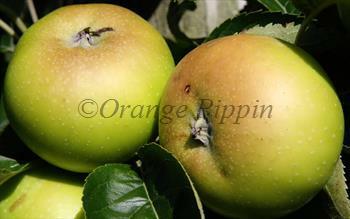 Galloway Pippin is a well-regarded dual-purpose apple from south-west Scotland, ripening mid/late season. When picked Galloway Pippin is best treated as a cooking apple, and slices kee their shape when cooked. The apples keep fairly well, but lose their sharpness - and then become more suitable as brisk eaters. Galloway Pippin is noted for its attractive blossom. Please fill in the details below and we will let you know when Galloway Pippin apple trees are back in stock. Galloway Pippin is in flowering group 3. Galloway Pippin is a triploid variety and cannot pollinate other varieties. It needs to be pollinated by another tree of a different variety nearby. You can either plant a self-fertile variety (which will pollinate itself and the Galloway Pippin) or you can plant two pollination partners which must each be of different varieties and able to cross-pollinate each other as well as the Galloway Pippin. If you need further advice on this just get in touch. Since it flowers in the middle of the blossom season it can be pollinated by most other apple trees. Galloway Pippin is a hardy tree, particularly suitable for areas with mild damp climates (in which fungal infections often thrive). Galloway Pippin is an old Scottish variety from Wigtown in Galloway. It was first recognised by the RHS in 1871, when it was awared a 1st class certificate, but is probably much older.